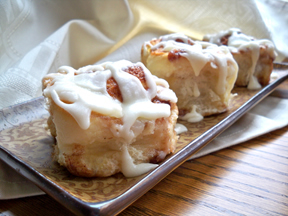 Delightfully delicious sweet rolls. 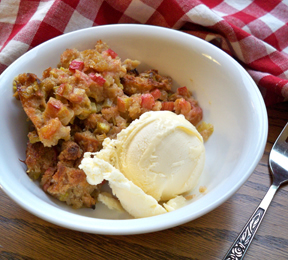 If you are a rhubarb fan, this is just one more way to enjoy it. These Rhubarb Sweet Rolls create a sweet topping that will make you love these rolls. Combine the Bisquick mix with the milk. Stir until evenly mixed. If dough is too sticky to pick up without it sticking to your hands, add a tablespoon more at a time of Bisquick just until you can pick it up without sticking. Should only need 1 or 2 more tablespoons. Don't add any more than necessary. Roll dough out on a floured surface so that the dough about 12 inches wide. Line up the rhubarb stalks across the 12 inch width. Lay them about 1/2 inch apart. If stalks aren't long enough to cover the whole width just fill in with shorter lengths to cover the 12 inches. When entire surface is covered, start rolling the dough up. You should end up with a roll that is 12 inches long. Cut the roll into 1-inch sections. Place each section into a 9 x 13 baking pan. You should have 12 sections spaced out evenly in the pan. Mix the remaining ingredients in a saucepan and bring to a boil. Pour all the sauce over the rolls in the baking pan. the rolls will be floating in this sauce. Carefully transfer to the preheated oven and bake for 35 minutes. Remove from the oven and allow to set for 10 to 15 minutes. Serve warm. When serving, remove a roll and turn bottom side up on a plate. Scoop some of the sauce off the bottom of the pan and pour over the roll before serving. 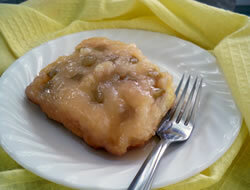 "I am getting to the end of my rhubarb but had enough to try this recipe and I am glad that I did. 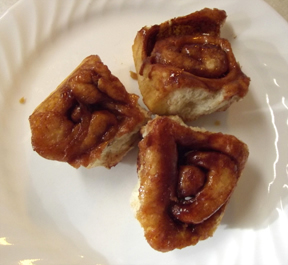 These sweet rolls were fairly simple and they were delicious. I was a little leery when I poured the sauce over the rolls because of all the liquid but they turned out great. All that liquid made a yummy sauce to drizzle over the rolls."